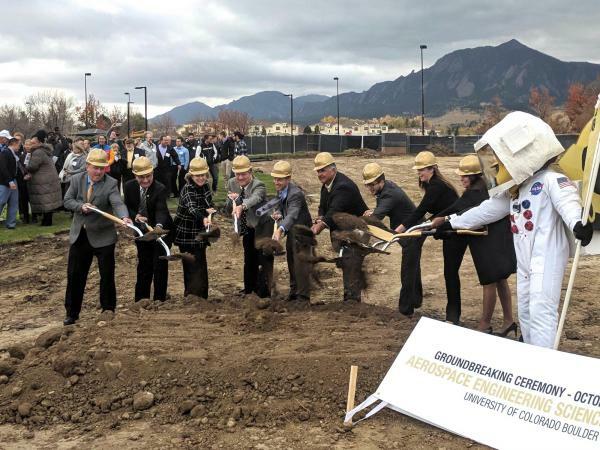 October 26, 2017 – The University of Colorado Boulder broke ground today on a new 144,000-square-foot aerospace engineering building, with spacesuit-clad mascot Chip turning one of the first shovels-full of dirt for the project. The state of Colorado is a hub of the nation’s aerospace industry, and the new facility, slated to open in the summer of 2019 on East Campus, aims to put CU Boulder’s nationally ranked Ann and H.J. Smead Department of Aerospace Engineering Sciences at the center of that innovation. DiStefano and other guests, including College of Engineering and Applied Sciences Dean Bobby Braun, Jay Lindell of the Colorado Office of Economic Development and International Trade, and CU alumna Kathryn Tobey, a Lockheed Martin Space Systems executive, joined students, faculty, staff, alumni and community members in kicking off construction of the new facility. The groundbreaking ceremony took place in front of the Sustainability, Energy and Environment Community (SEEC), and attendees were offered a chance to take virtual reality tours of the new building.